When and how to start with User Acceptance Testing? UAT tests usually have the goal to check if the client needs are met with the developed solution. Usually, this is done by checking the contract between the customer and the supplier. Therefore, User Acceptance Tests are necessarily undertaken at the end of the software development cycle. This means that the developed software (e.g. web app or mobile app) must be largely feature-complete. 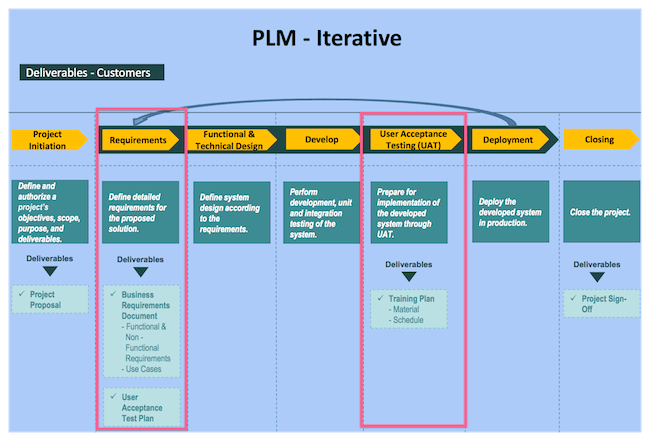 While the project team defines a UAT plan right at the beginning of a project (usually during the requirement definition), it executes the UAT test cases after development. Let’s assume we got hired by Atlassian to do a UAT test in Trello (yay!). Their development team approached us to check if the developed archiving feature for Trello cards actually works for the user. Testing the functionality of such a simple feature sounds easy, right? However, we want to follow a proper UAT test setup here. 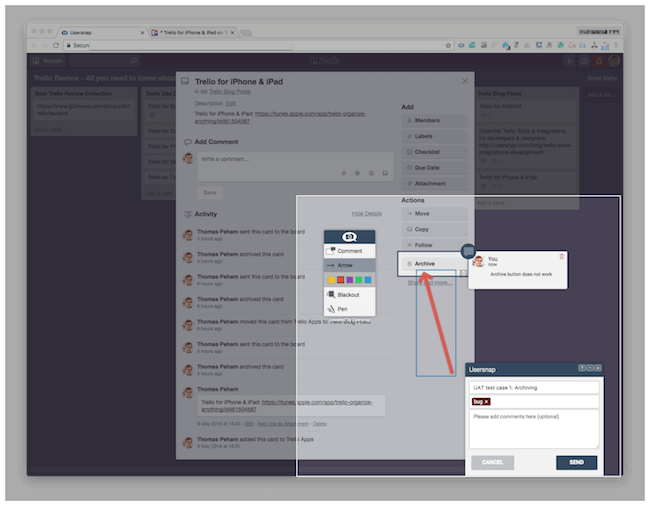 For our purpose of testing one particular feature of Trello, we make use of the available UAT test case template by the San Francisco State University. The SFSU template helps testers to identify, define, and execute UAT test cases based on defined requirements. The template ensures that all relevant information is available for the person conducting the UAT test cases. Let’s start by filling this template for our particular test case. First of all, we need to define the UAT scope of our particular test case. As we are in charge to test the newly developed Archive feature of Trello cards, we define the list of features that we want to test, and the ones that are not being tested. As seen below, this test case example focuses on Desktop tests only, while mobile tests are not included in this UAT test case. After the definition of our UAT scope, we need to be aware of the assumptions and constraints of the test. These assumptions and constraints include timing and available resources, as well as test documentation processes. For our test case example of testing Trello’s archiving feature on desktop, constraints could be the operating system to be used and specific browser versions. In addition, we must also clearly state the defined assumptions, such as how our test environment looks like, or how a tester should handle the error reporting. As UAT is a very crucial part of the software development cycle, we must look at potential UAT risks while planning, executing and analyzing our UAT test case. Not properly trained UAT testers: Our UAT testers might not be properly trained and don’t have complete knowledge of the business and user needs. 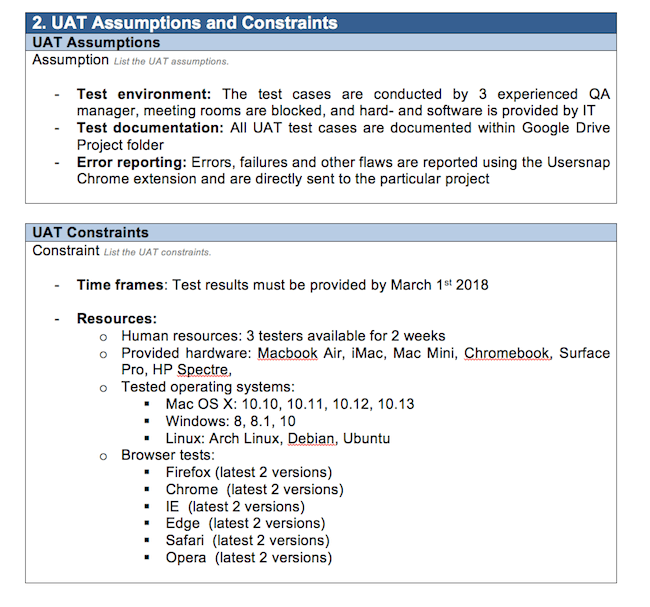 Incomplete UAT environment: Due to lack of resources and time constraints, tests might be incomplete by the defined deadline. Error handling: The testers might not how to properly report errors and bugs while testing. UAT test failure: Sometimes the developed features are incomplete and lack too many bugs which do not allow a test case to be completed at all. Participants of a UAT team can vary from project to project. The entire UAT team will be responsible for coordinating the preparation of all test cases and its execution. While all previous steps aim to ensure a well-executable test case, it’s now time to describe the actual test case itself to be successfully conducted by the UAT testers. In order to execute a test case, testers follow the described test cases step by step. Ideally, the tester can successfully execute the test. However, one important part of UAT testing is to report unexpected behaviors of the software, or even real bugs. UAT testing tool, such as Usersnap, support UAT testers to report errors, bugs, and other flaws while executing a UAT test case without even leaving the test context. Usersnap is present in the application and can be invoked every time the tester experiences glitches or bugs. With Usersnap in place, you can execute a test case in an efficient manner, while all bugs and errors are reported on the fly without leaving the test scenario. Since all created bug reports are directly sent to your project dashboard, your project managers and developers can easily reproduce the identified bugs and fix them timely. After successfully completing the UAT test cases, every tester must provide their test results. A well-documented UAT test case enables the product or project team to conclude on the next steps and define next actions depending on the test results. Last, but not least, both service owner and project manager, need to sign the conducted test cases. After sign-off, the tested feature is good to go and available for production. 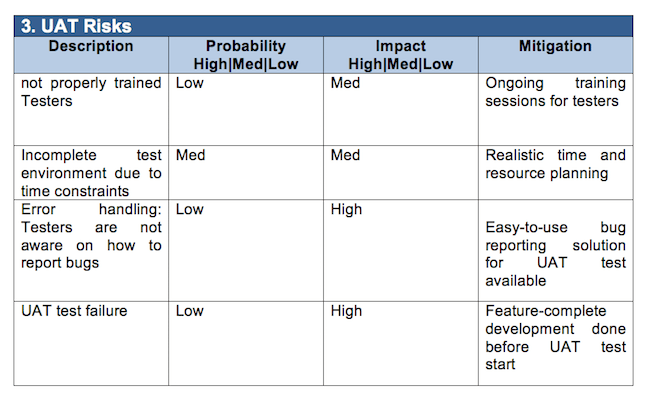 All in all, we’ve shown you all relevant steps for conducting a UAT test case. 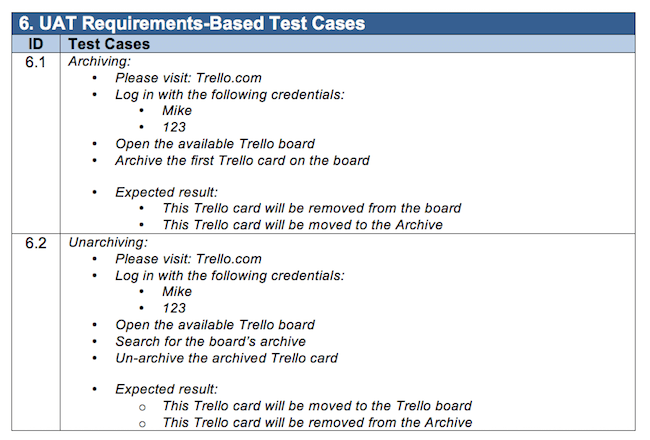 You can find the fully conducted UAT test case example for Trello here (and as a PDF version here). From identifying the UAT scope and risks to describing and executing the particular test cases, such a user acceptance testing example shows you the necessary, practical tasks. In order to start with UAT, I’d love to recommend our very own User Acceptance Testing solution from Usersnap. Used by small to large companies, like Microsoft, Hawaiian Airlines, and others, it helps you manage your UAT efforts.